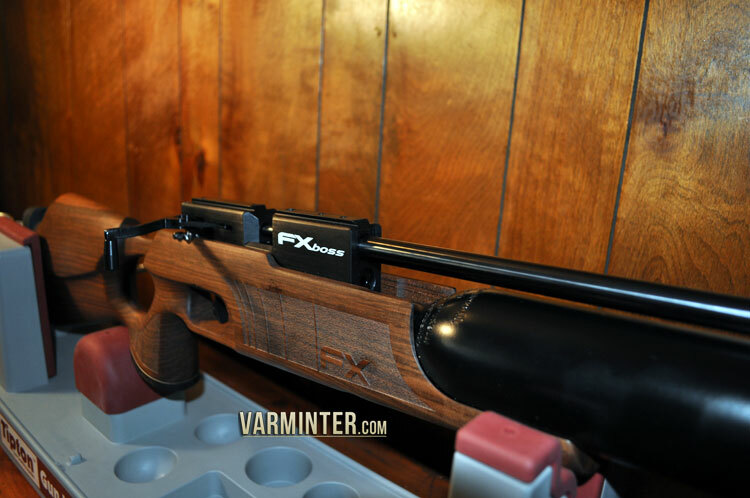 The FX Boss .30 Caliber Airgun is one of a new breed of commercial big-bore airguns that are filling an ever-widening niche for serious airgunners. When I got access to one, I jumped at the chance to take it into the field and video some kills. 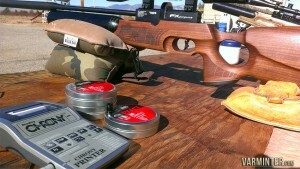 However, a little time shooting some pellets at some targets, and through a chronograph, would have to come first. 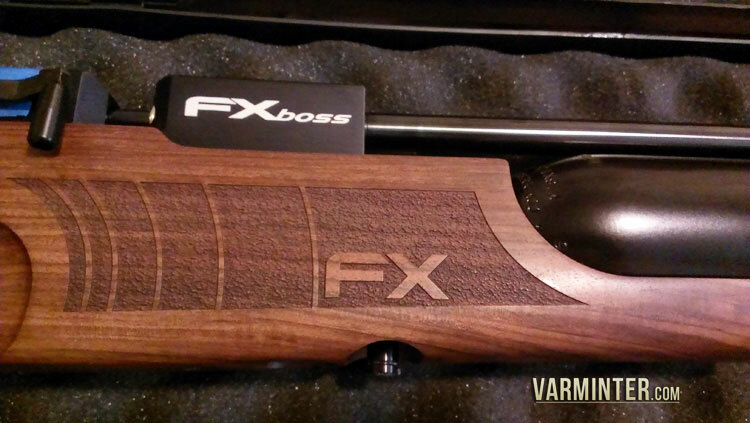 When my buddy, Jim, emailed me to tell me that he just picked up an FX Boss in .30 caliber, I was really excited for him. 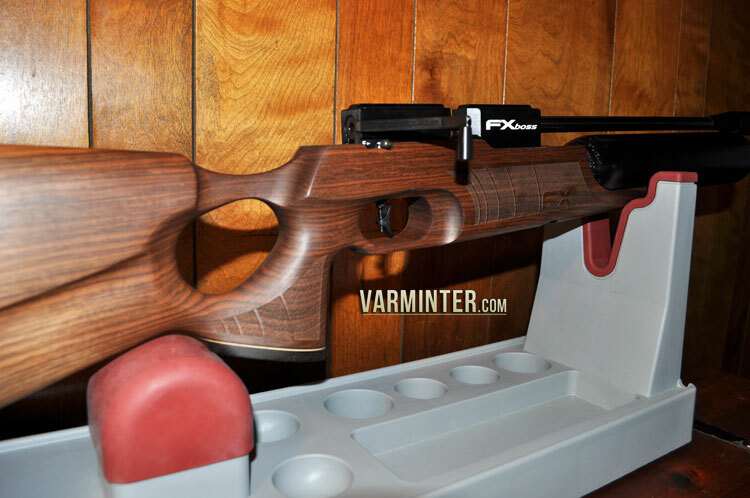 I had been reading about the Boss on some of the airgun forums for the past year and was very impressed by the look of the rifle and the accuracy that shooters were reporting. As I read more of the email, it became apparent to me that Jim wanted me to come by his house, pick-up the rifle, mount the scope and do a thorough test. Lastly, he wanted me to try and kill a coyote with it. I was somewhat shocked and asked a few times if he was sure. He was, so I went over to pick-up the rifle. We headed over to a local burger joint called “The Habit” and discussed the Boss a little. 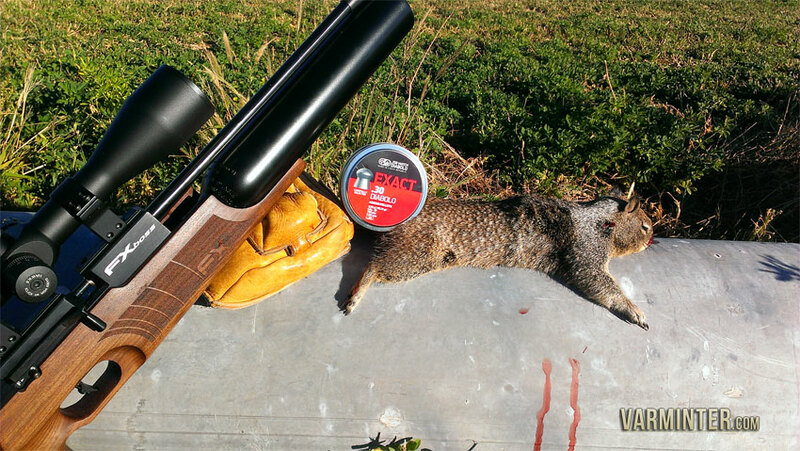 He, too, had read the reports of excellent accuracy and was eager to see what a 50 grain pellet would do to a coyote. He believed (as did I) that it would be more than enough gun for the job, with plenty of foot pounds of energy to put fur on the ground. 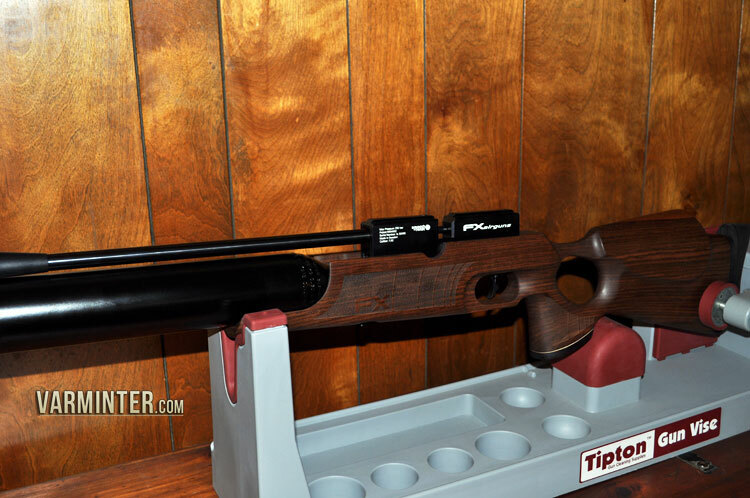 After I got home with the rifle, I carefully opened the box and set the Boss on my Tipton rest, so I could clean it and mount the scope. As I was doing this, I began thinking about getting some help with the review. I immediately thought of Cedric Sophus from the Tofazfou (Too Fast For You) Blog. He has lots of experience with big-bore airguns, including building his .257 “Talondor” rifle, which is a high-powered airgun that he has already used to kill a couple of coyotes. When I told him my thoughts, about collaborating on a full article and video, he was also very interested. So began our quest to get the FX Boss into the field for some work on varmints and hopefully, a coyote! The Boss .30 was on a limited loan venture that did not allow tons of time for testing. But, being well versed in air guns/guns and their traits, it’s no different than any other airgun when it comes to “GETTING THE GIST OF IT”. The .30 caliber pellet (Diablo) guns are very new. 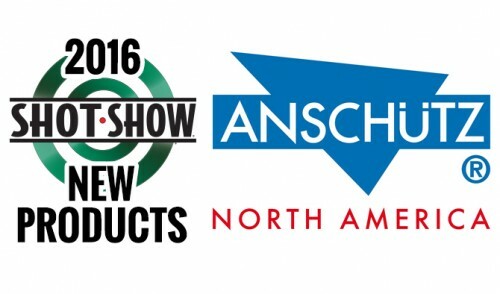 There is still a lot of discovery left about the .30 caliber projectiles. But so far, ballistics coefficient (BC) is roughly in the .04 BC range for the 44 gr JSB diablo pellets. JSB .25 cal Kings are roughly .033 BC. 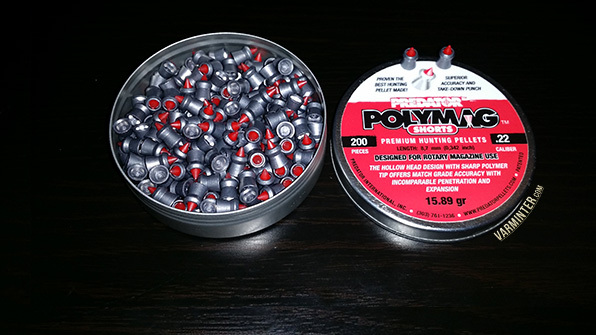 .30 caliber pellets are so far only manufactured by JSB and available in two different weights, 44 grains and 50 grains. The caliber (.30) is also pretty unique to us here in the states. It is actually a European caliber, which means that unlike here in the states, it is NOT .308” but .303”. Odd for us westerners, but a deadly round none the less. 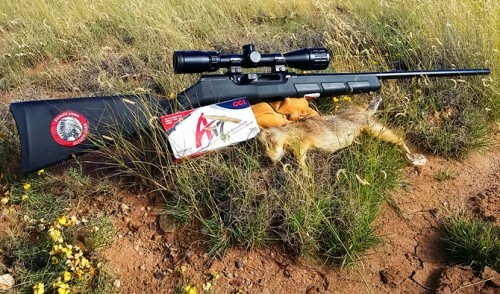 For an air gun, 40+ grains is super heavy but combined with that above listed BC and it equates to a very heavy hitting projectile that will prove “DEADLY” on game up to Coyotes within range. The barrel on the Boss is also something new. It’s called the ST or SMOOTH TWIST. 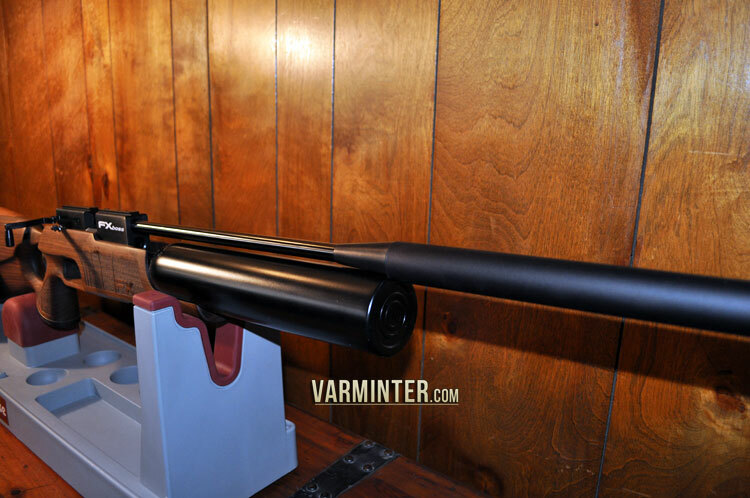 This means that the bore is actually SMOOTH like that of a shotgun and only rifled at the very end of the barrel (“end” meaning the last 1.5-2”). Yes, that’s right, the ST barrel is smooth from the breech all the way down to the last 2” of the muzzle where it is rifled. 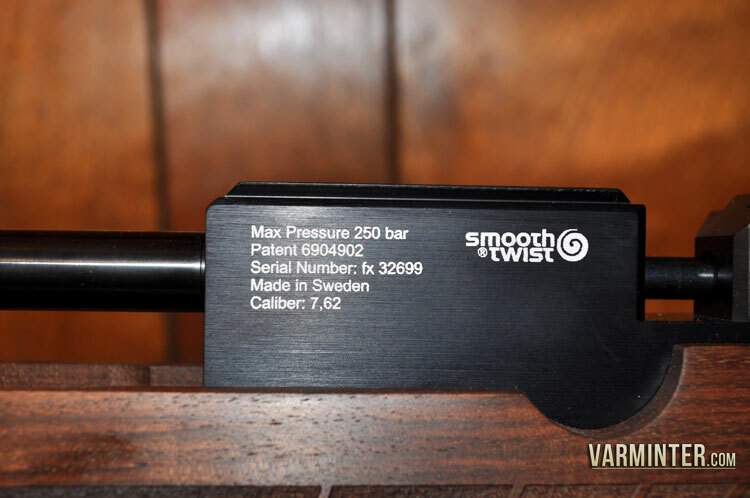 This is unlike a fully rifled barrel and so far, this new style of barrel is proving to be just as accurate, if not MORE accurate, than a fully rifled air gun barrel. With that being said, the twist rate at the end of the muzzle is showing signs of being much slower than conventional thought. It’s definitely NOT 1-16” turns but over 1-48”+ turns. These barrels are proving to be extremely accurate with the .30 caliber JSB pellets in the 850-890 FPS range. I’ll have MORE CONCRETE INFO TO COME AS THIS BARREL BECOMES MORE AND MORE POPULAR AND WIDELY USED. 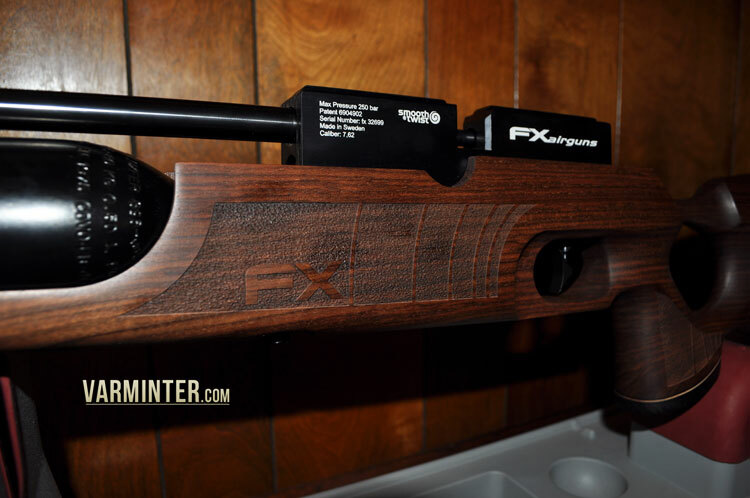 FX Airguns (based in Sweden) have been around for a long period of time and are well built. They are light, powerful, quiet, well made, and very easy on the eyes. The FX Boss we tested proved to have all those traits BUT, it is very long due to the shroud on the end of the barrel. The shroud does not come back to the breech like other shrouded air guns. 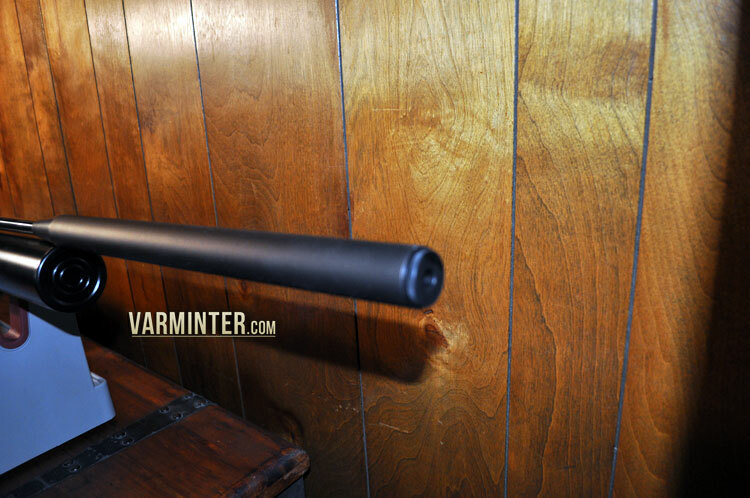 Instead, it STARTS about ¼ of the way from the muzzle down the barrel, then back over the barrel and way past it. This causes the barrel to appear much longer than it actually is. This also adds to the over-all-length of the Boss. Even though it is long, the gun (like many FX guns) is really light for the length. Did I mention that the gun is LOOOOONG….lol! Speaking of the shroud, one of the nicest features on the gun is its silence due to the shroud. The gun Eric and I tested is really quiet for the power and even a couple of airgunning bystanders commented on how quiet it was. It’s deceptive even. It is even quieter than a few SMALLER calibers that I have had the opportunity to shoot. With only 2 pellets available right now (from a very respectable manufacturer – JSB), the accuracy is superb considering the big caliber. Well, not so much caliber but the fact that it is a .30 caliber DIABLO projectile. When shot in the 880-890 feet per second range (fps), it is not uncommon for the gun and pellet combo to produce around .750” groups at 50 yards. But I will say this, the gun is more accurate than the pellets. The JSB’s weight goes from one extreme to the next. 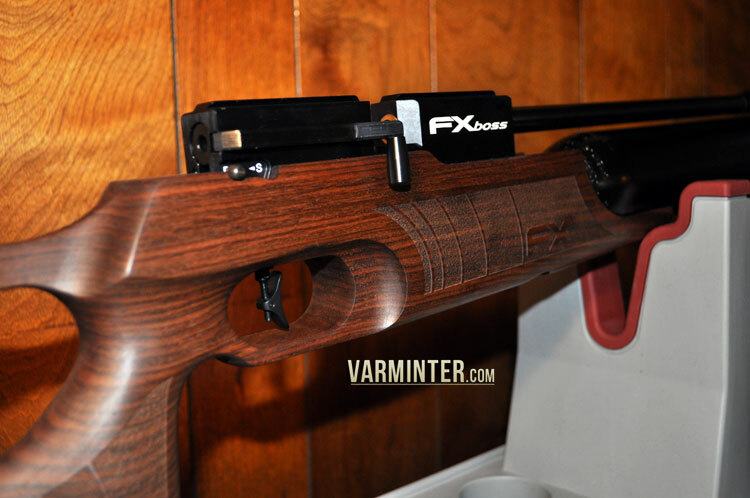 The Boss itself is regulated and very consistent in shot to shot fps spreads, if the pellet weights are consistent. Accuracy will reflect this. 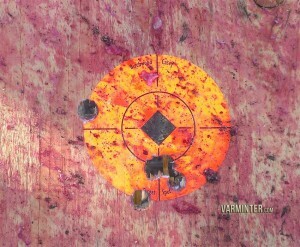 On a whole, with carefully selected pellets, there is no reason why the gun can’t shoot .5” groups at 50 yards. 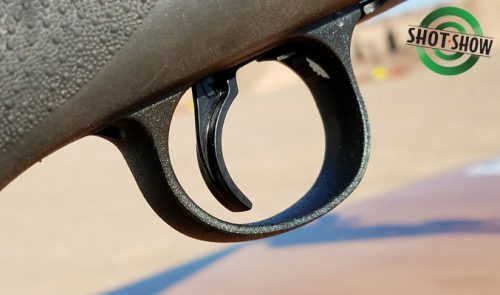 My only complaint about the gun is that the accuracy from a 250 BAR fill tends to wander from RIGHT to LEFT as you shoot more and more groups. When Eric and I started sighting in the gun, it was apparent that the groups wandered from the RIGHT of bulls eye to the LEFT of the bulls eye. But the groups remained very tight. 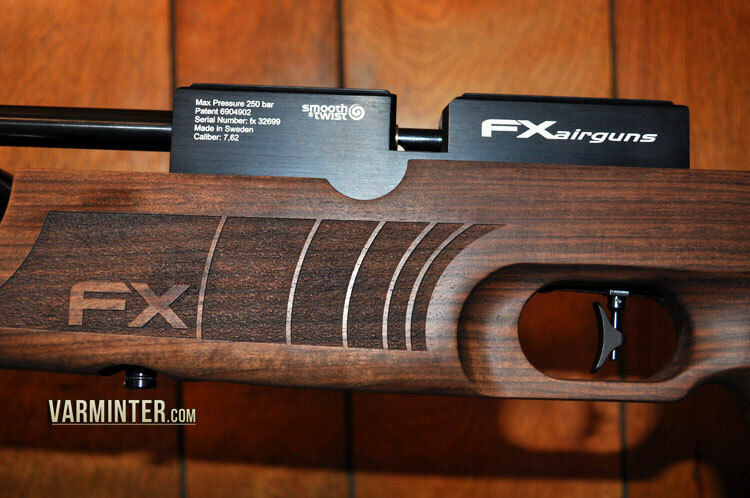 I truly like the gun and would buy one if my finances allowed (it is currently listed at +/- $2200). 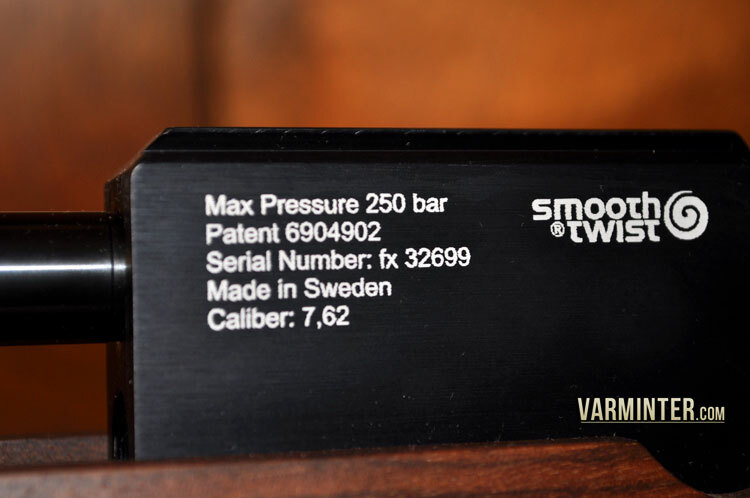 This gun was new in the box and had not been tuned or tested previously. So, while accuracy was great, the shifting of the POI (right to left) had me a tad concerned. If it were mine, it would be stripped down, cleaned and checked for any deficiencies. But this is not Eric’s nor my gun. And, this is a TRUE testament of how an AVERAGE Boss at any moment could be expected to perform or ANY airgun for that matter. My report of shifting POI is not the first as I consulted a few others on the forums and they reported the same but it is NOT the same with EVERY Boss. 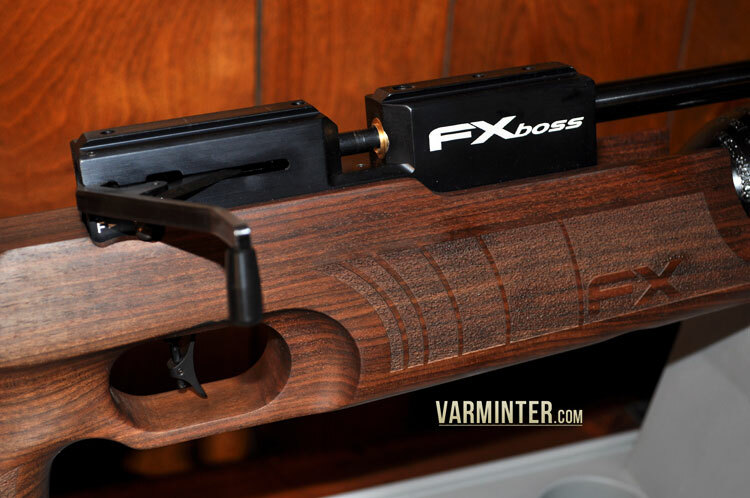 The Boss debuted in or around 2012 and won its Maiden Voyage at the Arizona Extreme Bench Rest and I can surely see why. While having some awesome wind bucking ability compared to the 25’s and under, the pellet itself at 880+ fps, using a 44+ gr pellet does have some serious drop. This is something that takes a little getting used to. 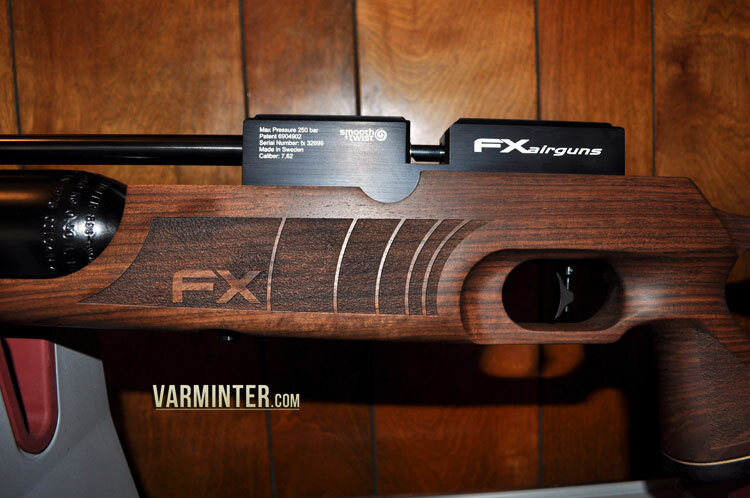 The wood and finish on the barrel and receiver are spectacular and is a testament to the FX company’s sense of craftsmanship in making beautiful and functional guns. 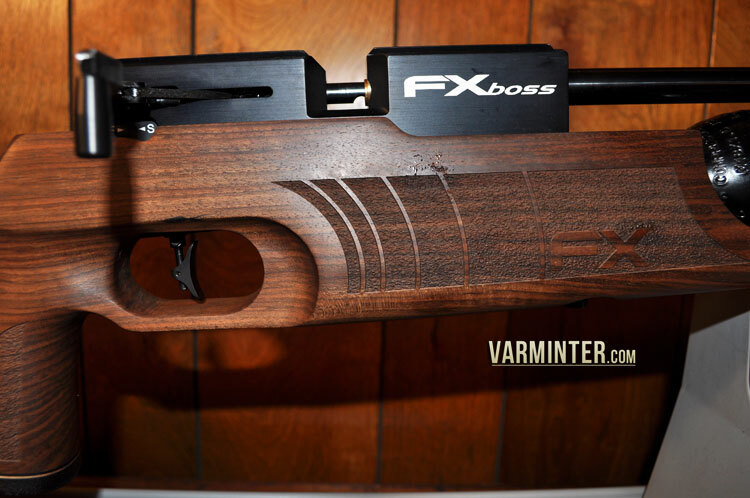 Not only the finish but the workmanship on the gun was superb and it shows that FX is no slouch. 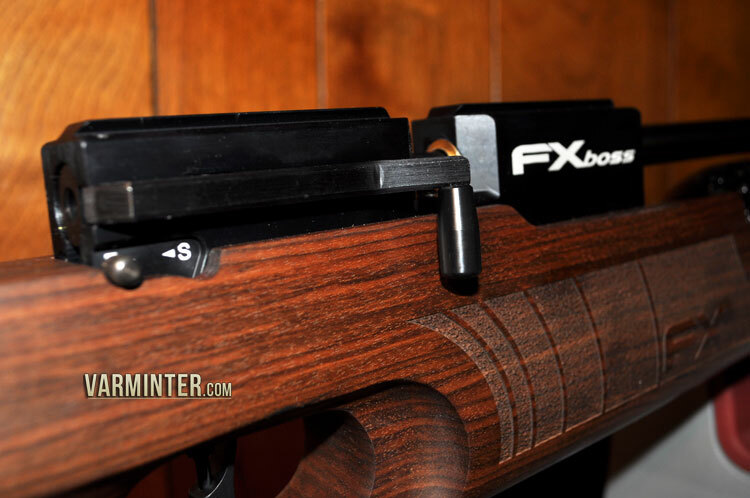 While this rifle is as long as my full blown THEOBEN RAPID .25, the FX Boss is over 1.25+ lbs lighter. 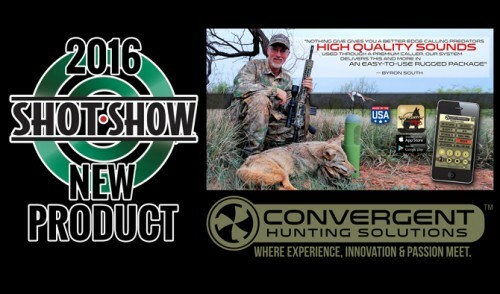 A small portion of our target work, as well as some of our hunts, is included in the video posted below. Before that, I wanted to say a few things about the FX Boss. While we did end up taking it coyote hunting, we did not have any that came within the range I felt comfortable with (<100 yards). 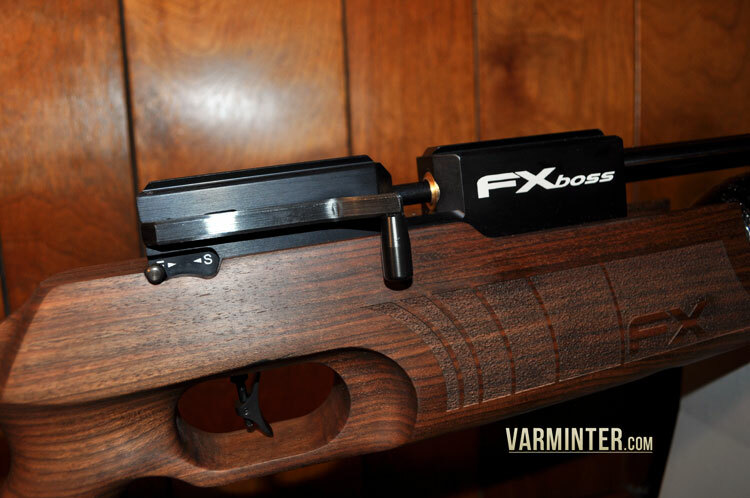 Although the Boss is an excellent rifle for varmints from a bench, or other type of rest, I felt that the length hindered me while on the stand. Too often, I found the barrel caught up in the bushes I was tucked into. Also, trying to adjust into a shooting position, without being spotted, proved to be fruitless. Perhaps more time hunting coyotes with the Boss would have allowed a better opportunity, but the weather did not cooperate here in Southern California. While the rest of the country was freezing, we were experiencing higher than normal temperatures due to Santa Ana winds (desert winds). 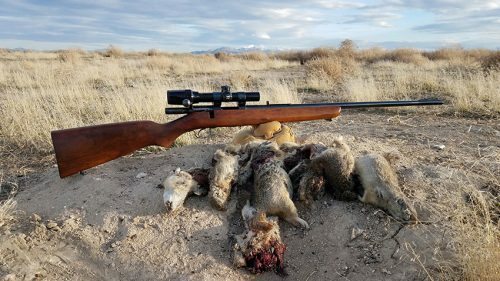 The unseasonably warm weather did bring out other varmints and I was successful in shooting some ground squirrels on video. We did get plenty of time at the bench shooting the FX Boss. The chronograph results with the 44 grain and 50 grain pellets were surprisingly close, but the nod went to the 44 grain pellets due to being a bit flatter shooting. 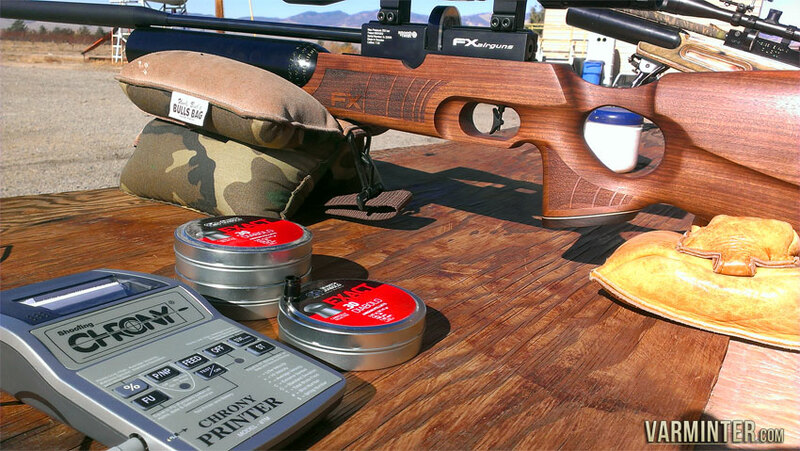 Cedric and I enjoyed shooting various targets while at the bench, but pomegranates turned out to be our favorite. The farmer had just dumped a pile of under-size, or animal damaged pomegranates near where we were shooting, so we used many of them as targets. Lots of pomegranates died while we tested the energy of the Boss. We were also shocked to see the damage these pellets flying at 850 to 880 feet per second caused! We got some good video, a very sticky GoPro (look for it in the video below) and made some quail very happy as they came out to eat the seeds we scattered about. A testament to the lack of noise the Boss puts out was the quail that fed on the seeds while we kept shooting at targets setup just a few feet away. As stated above, I was able to take a number of other smaller varmints with the Boss and found it to be extremely efficient. As you watch the video below, you will hear me use the word “authority” when speaking about how hard the 44 and 50 grain pellets hit. 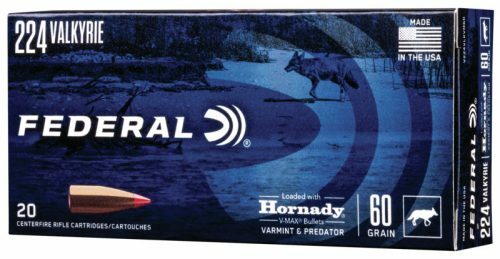 My wife chuckled at me using the word (because I rarely do), but it was the only word I could think of to describe the absolute power the pellet had when smacking the varmints. 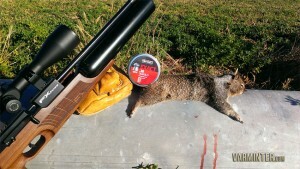 Two of the ground squirrels I shot (on video below), weighed over 2 pounds! That is a very big ground squirrel for winter time in Southern California. The higher foot pounds of energy of the Boss killed all the varmints I shot immediately. I can picture a hunter with this rifle taking various types of medium game animals, such as smaller Deer, Wild Hog, some Exotics and possibly Javelina. 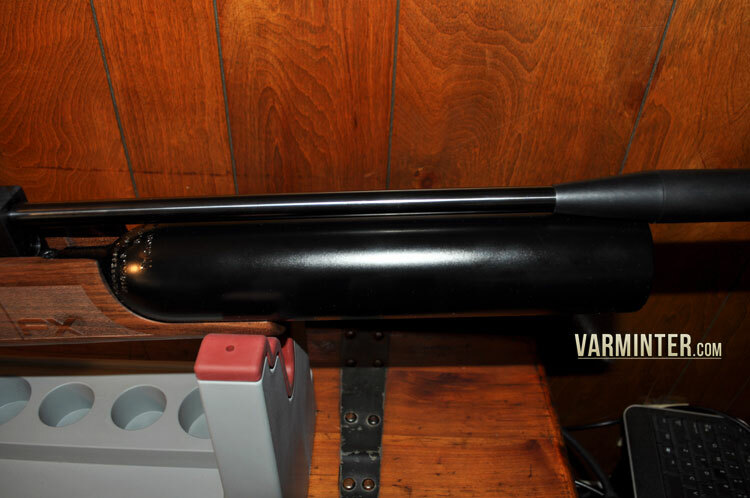 Unfortunately, although we are seeing more states change their regulations to allow bigger bore airguns, there are only a handful of states that offer those opportunities right now. 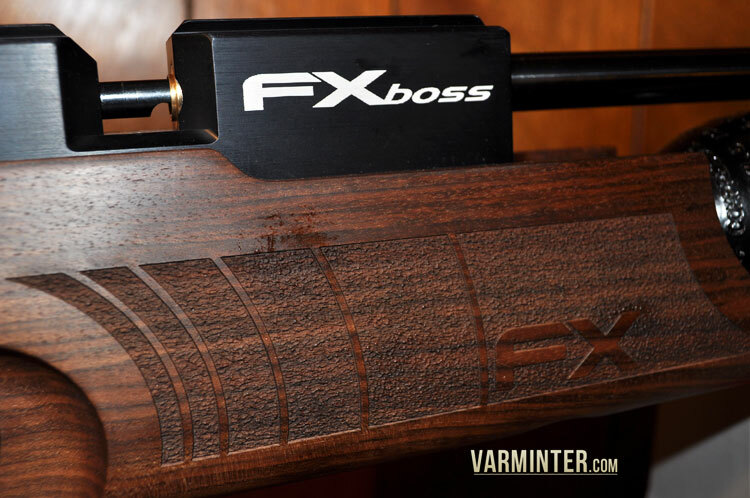 If you do get an opportunity, the FX Boss is a great choice for anyone looking to expand their arsenals into something a little bit different. 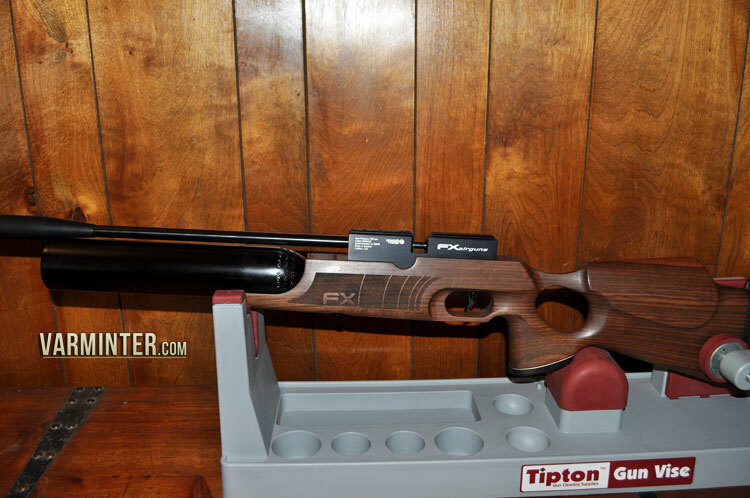 Special thanks to Cedric Sophus, who is a knowledgeable airgun (and powder burner) shooter. When not working, hanging with his family, or tinkering with melted lead and ballistics gel in his workshop, he can be found on the Tofazfou Blog.